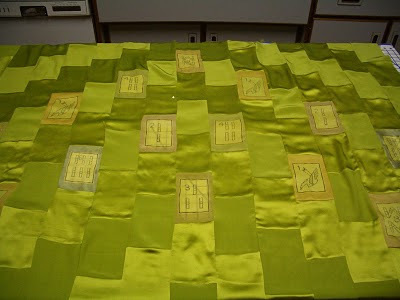 Here is the yardage I have been constructing (lots of cutting, pinning, trimming, ironing, sewing, ripping, re-pinning, re-sewing re-ironing, etc. ) over the last several weeks. It's made of silk and combined is such a way to resemble a twill. I am hoping that on a runway, the model will open the coat to show off the lining and the lights will pick up and reflect off the different textures and show off the twill. It had to be twill since it will be the lining for my mystery story coat. The story woven into the coat is called The Case of the Undulating Twill - a tale of mahjong and murder. The mahjong tiles pictured in the lining are a clue to the mystery.